KATHAM Chiniah sits on a pavement along the Kallang-Paya Lebar Expressway, oblivious to the exhaust fumes of passing vehicles and pedestrians who have to walk around him. The 35-year-old, who arrived from India two years ago, spends his weekend evenings here with up to 80 other migrant workers. He and his friends gather at this concrete walkway along Lorong 4 Geylang for picnics, bringing beer and fruits. Inspite of its location, which borders a sleazy red-light district, Chiniah says, “It’s comfortable, peaceful.” All around, the bright lights of 24-hour food stalls and neon signboards of hotels keep the street alive, even at midnight. For these workers, the narrow pavement provides breathing space for them. It lies just outside their dormitory which had been converted from old apartments. “Inside, too many people, it’s squeezy,” Chiniah adds. He also prefers this place to Little India, an ethnic quarter where South Asian workers meet up during weekends. “Little India too crowded. Nobody disturbs us here,” he says as he taps the concrete ground. Still, such gatherings of foreign workers are not a welcomed sight in Singapore. The fear of these workers invading public spaces came to light when the saga that centered on Serangoon Gardens gained media attention in September 2008. In that event, residents of the neighbourhood protested against the government’s plan to house 1,000 migrant workers in a vacant school nearby. This led to an uproar as more people began raising concerns over workers loitering and congregating in their vicinity. Common worries included workers behaving rowdily after drinking alcohol and the littering of leftover food. Spaces taken up by foreign workers en masse, especially in areas such as Geylang, Little India and Jurong, reveal how “the Third World has manifested itself in our city,” says Professor Ho Kong Chong, an urban sociologist from the National University of Singapore (NUS). These ‘third-world spaces’ were not as apparent in the past. But a sharp increase in the number of migrants coming into Singapore in the last five years has placed an added pressure on the city’s limited land capacity, explains Prof Ho. The influx of these workers first took flight in the 1990s when the economy expanded. The figure stood at 300,000 in 1994 and rose to 500,000 in 2008. “The problem doesn’t lie in the workers, but in the sudden, sheer number of their arrivals over recent years,” he adds. Dormitories can no longer contain all of them comfortably, he says, creating spillage onto public spaces. Yet, not all places are welcoming. Bangladeshi worker Mohammad Alauddin, who hangs out at Lorong 4’s pavement with his friends, looks toward the row of shophouses across the street. “We can’t sit in coffeeshops or shopping centres for long because we have to keep paying for more cups of tea,” he laments. From the pavement, the view isn’t bad at all. Beyond the expressway is an alluring scene, where the skyscrapers of Suntec City, Millennia Tower and Pan Pacific Hotel come together to paint a picture of luxury. Dressed in polo shirts and jeans, welder Ramesh Kumar and his friends fit right into the weekend crowd at Jurong East. Many people visit the nearby IMM mall to indulge in Singapore’s favourite pastime of shopping, but these migrant workers are here for another kind of addiction. Workers living in the nearby dormitories come to this field located next to IMM Building to play cricket every weekend. “We play cricket here every Saturday evenings and on Sundays,” says Kumar, who stands on a waterlogged field overgrown with knee-high grass. In the middle is a slender four-metre strip of sandy ground, dry and parched from regular cricket matches. 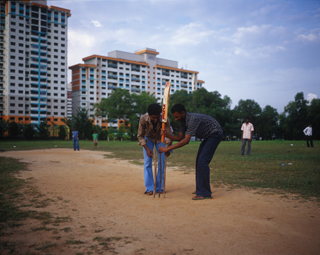 Pointing to buildings near an industrial estate some 400 metres away, Kumar says, “That’s where our dormitory is.” With no space big enough for cricket at their living quarters, the group of 20 Indian workers took to the field that once laid unused. Director Shaik Mohammed, whose company Mini Environment Service runs four dormitories, says it’s only natural that migrant workers would spill out to these public spaces. The field in Jurong East is not just a cricket ground. A bunch of Malaysian and Burmese workers have also taken advantage of the land the size of two soccer pitches. Each weekend, they turn up in brightly-coloured jerseys for soccer games, occupying another area within the field. This afternoon, they have convened for a match. Foreign languages punctuate the air and bring the place to life. It isn’t easy to find an open field this huge, especially in our urban setting, but such an emptiness is all that the workers would ask for to keep their game going. Lured by the prospects of a First World nation, Hussein left his city of Dhaka for Singapore, only to realise that his agent was a fraud. “No job, no money, no go home,” the Bangladeshi says. To earn a livelihood, he churns out packets of jhaal muri, a South Asian street snack of puffed rice, chilli bits and peanuts. His makeshift booth is built from a long piece of cement tile held up by two styrofoam boxes. It stands in the middle of a plaza rimmed by the lanes of Desker, Lembu and Syed Alwi Road in Little India. People stream out of the popular 24- hour Mustafa Centre nearby, looking for something to eat. But they don’t step near Hussein’s stall. Still, he is not short of business. At this plaza, affectionately known as Bangla Square, more than 200 Bangladeshi workers gather every evening, all potential customers to Hussein. 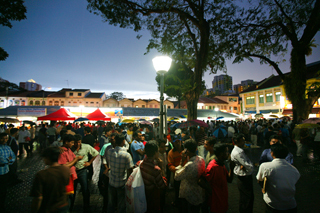 Affectionately known as Bangla Square, the place teems with no less than 200 foreign workers each evening. Some 10 years ago, before it became an unofficial gathering point for these workers, landlord Lim Geok Seng, who owns a coffeeshop beside it, describes the place as dirty and run-down with “an overgrown garden”. In 1996, he took in Al-Mustafa – the first Bangladeshi eatery within the locality. By 2000, Lim’s stalls and the surrounding coffeeshops were all selling Bengali cuisine. At around the same time, the National Parks Board cleared the dense weeds at the plaza to make way for bricked ground, in recognition of the growing number of patrons. The area reminds Devanathan Parthasarathy, a visiting fellow at the Asia Research Institute, of the streets in his country. “This place is like a nukkad in India, which means street corner,” the urban sociologist explains. “Anything and everything can happen on such a street,” he adds. Apart from food booths, Bangladeshi men also hover around a carom table found under the shade of blue canvas sheets, intently watching a game. Last year, Bangla Square, along with Desker Road and Lembu Road, were collectively conserved as part of the Urban Redevelopment Authority’s (URA) Master Plan. According to URA, the location has been “an integral part of the Little India Historic District,” and with a mixture of old shophouses, “the buildings give the streets a strong urban identity,” the plan notes. Such conservation is closely linked to heritage tourism, Professor Chang Tou Chuang from the geography department at NUS observes. In order to cater to tourists, these areas often end up planned only for their needs. They become “contested sites, where users and planners have different perceptions of how the space should be used,” says the expert in tourism studies. Wham, the executive director of Humanitarian Organisation for Migrant Economics (HOME), recognises that the area was never planned for them, but he hopes that the state would acknowledge foreign workers as important users of Little India. With many Indian businesses there that provide for the community, “over a passage of time, it is only natural that foreign workers would eventually claim the space as their own,” he notes. Standing rigid in the middle of the plaza is a closed-circuit television camera that reminds the workers of an invisible authority. Even as Bangladeshi workers hang out at Bangla Square to feel at home, the place isn’t theirs. Pick up any official map and try locating it. Chances are that you can’t – urban planners here call it the “Lembu Road Open Space” instead.